Whatever regrets we may have about the history of Australia from the first settlement in 1788 we can never be sorry that we inherited from the British their love of cricket. We don’t always win test matches but on the whole we’ve done rather better than any other cricketing country. I was fortunate to bat at all. On the Friday I tore a leg muscle which prevented me fielding on Saturday. This was followed by an attack of gastritis which kept me in bed most of the weekend, and I felt far below par on the Monday. Even then my leg was heavily strapped and the whole innings was played off the back foot. I scarcely made one forward shot the whole day. England batted first: they were all out for 255 and Barnes, who had opened for Australia with Morris, was on 71 when Bradman finally appeared at the crease. I was with the crowd on the hill and being ignorant of Bradman’s problems wondered why he didn’t appear when Morris got out. My perplexity increased when Johnson, Hassett and Miller appeared before Bradman. To the best of my recollection Bradman and Barnes were together on about 150, Bradman having made 150 runs while Barnes made 79. Bradman went on to make 234 and so did Barnes who gave his wicket away, not attempting to score after Bradman was out. Barnes had faced 667 balls for his score while Bradman, in spite of his handicap, took only 396 balls for the same score. Together they set a test record of 405 for a fifth wicket partnership. Bradman was then aged 38 and his best years were behind him. In England in 1930, at the age of 21, he had set a test record of 334; 309 of them in one day, but he could still make more runs than his younger contemporaries – and make them faster. The innings was declared closed at eight wickets for 659. The next highest score in the Australian innings was 40 by Keith Miller. Australia won the match by an innings and 33 runs and went on to win the series. Bradman captained Australia in the 1948 tour of England, where the team became known as ‘The Invincibles’, having never lost a match. Some of Bradman’s records have been broken but no batsman has ever come near his test average of 99.94. It is well known that he had played first grade cricket for St George before he played for New South Wales for whom, in a Sheffield Shield match against Queensland, he scored a record 452 not out. As Australians, we can all be proud of him but as residents of Glebe we have no local connection. When he was six his family move to Glebe. He was educated at the Forest Lodge Public School, where fellow-pupils included the cricketers Charles Kellaway and Warren Bardsley, and at Sydney Grammar School in 1899-1900. Tibby Cotter joined the Glebe District Cricket Club in 1900 and established himself as a fine pace bowler and hard-hitting batsman. In 291 tests Cotter took 89 wickets, seven times taking five in an innings, at an average of 28.64 each. Among his best performances for Glebe were four wickets in four balls and his highest score of 156 which included 16 sixes5. He joined the AIF in 1915 but was killed in the war. Although born in Warren NSW, Bardsley attended the Forest Lodge Public School. His father taught at this school for over forty years from 1883. At age 17 Bardsley played for Glebe in the Sydney first-grade competition. He made his State début in 1903-04, and won selection in the Australian team to visit England in 1909. Bardsley served briefly as a NSW and Australian selector. He died of heart disease at Clovelly on 20 January 1954. Charles (‘Charlie’) Kelleway, another local boy to represent Australia, had also attended Forest Lodge School. He played in 26 Tests between 1910 and 1928. 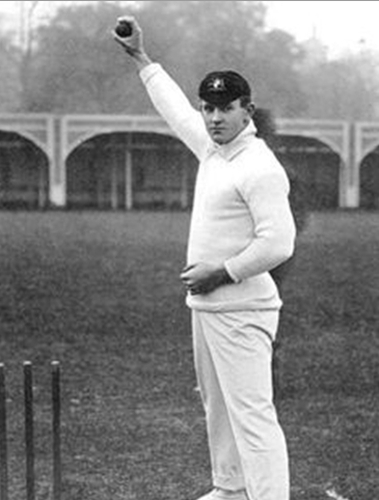 Kelleway had served as a Captain in the AIF and was the first captain of the AIF Touring XI. He died in Lindfield in 1944, aged 58. William Albert Stanley (Bert) Oldfield began his career as a cricketer playing in the NSW Churches Cricket Union and made 84 in his first game for the Glebe District Cricket Club of which he became secretary in July 1915. Oldfield served with the first AIF as a corporal in the 15th Field Ambulance. He was selected for the AIF cricket team which played 28 first class matches in Britain, South Africa and Australia. His first test match was in the 1920-21 season in Sydney against England. Oldfield received a fractured skull during the infamous third Test at Adelaide– one of the ‘Bodyline’ series. Oldfield played 54 Tests for Australia, scoring 1,427 runs at an average of 22.65, and taking 78 catches and 52 stumpings. His tally of stumpings remains a Test career world record. After his retirement, Oldfield he wrote two books, Behind the Wicket (1938) and The Rattle of the Stumps (1954), and managed the Australian schoolboys cricket team which toured Ethiopia, Sudan, Kenya, India, Ceylon and Singapore in 1965-66. The Glebe District Cricket Club no longer exists as a separate entity having been amalgamated in 1965 with the Paddington District Cricket Club to form the Sydney Cricket Club but it had more than justified its existence if only for the part it played in the careers of the abovementioned cricketers. 2. Max Solling, (1994). Under the Arches. 3. Max Solling (2008) Wentworth Park – its history and uses, Glebe Society website. 4. Rod Holtham (2014) Glebe and the Great War. 5. G. P. Walsh, Cotter, Albert (Tibby) (1883–1917), Australian Dictionary of Biography. In 1909, Bardsley was the first batsman to score a century in each innings of a Test Match, scoring 136 and 130 against England at the Oval. The record stood for more than 50 years. He played on four tours of England, captaining Australia on the 1926 Tour, when he was 43 years old. On the 1926 tour, he scored 193 (not out) against England at Lords – the highest individual score ever at Lords up to that time. Kelleway was a solid, dour batsman – he once batted for 7 hours, scoring 147 against England – and a useful medium-pace bowler. Against South Africa at Manchester in 1912, he became the third player ever to score a century and take five wickets in a single test match.